In this Bank of the River Seine I we see a romanticized scene of the river and the people enjoying the sunny Parisian day. The banks of the river or Les quais de Seine is a place which gave birth to an iconic location where artists, writers, and philosophers reveled and was said to be the center of bohemianism, counterculture, and creativity. In this piece we see people of the 19th century in their period dress and fashion, enjoying the day in the dappled lighting of the trees. 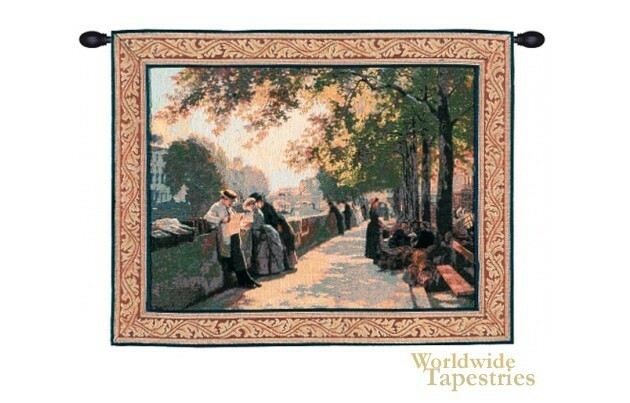 This Bank of the River Seine tapestry is backed with a lining and a tunnel for easy hanging. Note: tapestry rods and tassels, where pictured, are not included in the price. Dimensions: W 39" x H 32"